5 9.850 Tchikaberidze, Nia Southeastern Gymnastics Center 2018 Lights, Camera, Action! 18 9.800 McNeeley, Kalin Peoria Elite Gymnastics Academy I-Power Classic - Pink Meet! 18 9.800 Ulli, Nia Southeastern Gymnastics Center 2018 Lights, Camera, Action! 56 9.750 Ballesteros, Jessica Southeastern Gymnastics Center 2018 Lights, Camera, Action! 56 9.750 Ryan, Kylie Everest Gymnastics 2018 Lights, Camera, Action! 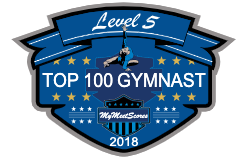 85 9.725 Fickes, Evelyn Everest Gymnastics 2018 Lights, Camera, Action!